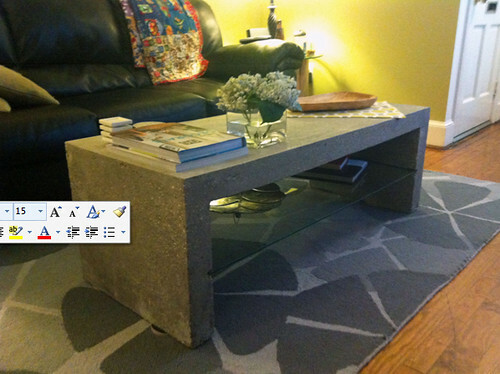 Thanks to Katie Moore of Olios Design in Old Town for submitting this incredible concrete coffee table her husband Andy built. It looks just like the inspiration piece from Crate and Barrel but at a fraction of the price! Last fall, my husband and I had a craving for a few new pieces of furniture yet didn’t have the cash to purchase much. Although we found ourselves hunting and hunting at stores like CB2, Crate and Barrel, and even Room and Board, everything we liked was out of our price range. At one of our trips to Crate and Barrel, we spotted this beauty. You may have seen this mason coffee table in their furniture showroom so you probably know what I am talking about. I walked in circles trying to find cheaper options, but my eyes were fixed on this table! The only thing holding me back was that price tag. At $799 I just couldn’t come to grips with it. Luckily my husband was there assisting with the selection process (or wish-list making, if you will). He is a contractor and is an artist at building things, including furniture! Right there in the store he began brainstorming, thinking, measuring, and sketching. At that moment we decided to build it ourselves. The total cost for supplies came to about $90 (plus a few extra dollars for coffee and gas). First, Andy made the form based on the sketch he had created. 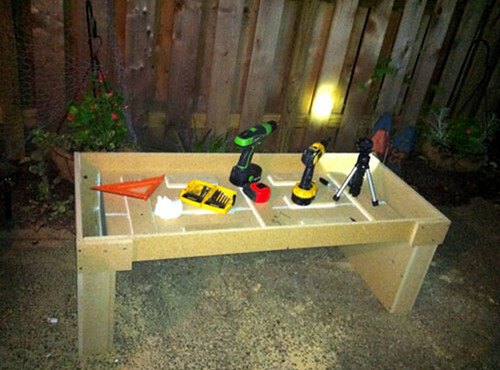 He cut the pieces of particle board using an electric handsaw and nailed/glued the form together. We chose particle board because of the smooth texture. Other types of wood would have left wood grain marks within the concrete which was not the look we wanted to achieve. The form was made using ⅝ inch particle board and the inside joints were caulked to allow rounded edges on the concrete. 1/2″ rebar and wire mesh were used throughout for tensile strength. The concrete was poured using a combination of Quikrete’s 5000 mix with an ad mixture to allow greater flowability. We had an old plastic storage container which Andy used for mixing the concrete. The concrete had to be mixed and poured all within one sitting. It took about 4-6 hours to complete this step. Note: Concrete is messy and can be difficult to mix properly and pour at the same time so make sure you have help. If you have never used Quickrete before, read the directions carefully before starting your project. 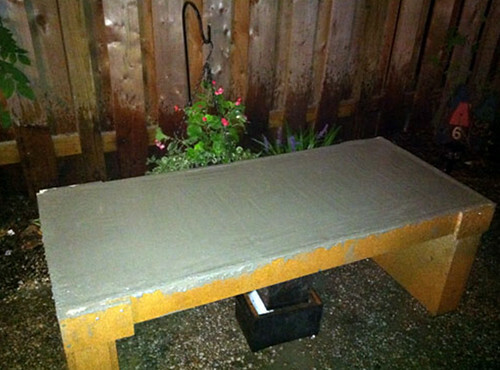 After pouring the concrete, we let the table sit and harden for about 10 days. During this time it did rain a few times so we used a tarp to protect the table. Once we felt the table was ready, Andy removed the form piece by piece. After the form was removed Andy sanded the table many times in order to get the look we wanted. From there, it took two very strong men to lift the table and carry it from our back patio “construction site” into our living room. To make this table our own, Andy had designed the frame to have indents on both interior sides of the table about half way down so we could add a glass shelf. The picture below does not show the shelf (it was still on order). Here’s the finished product with the glass shelf installed and a little redecorating. Side Note: The table weighs between 350-400 pounds (about the weight of a piano) so be sure your floor can support the load. If you have questions about this project, please contact Katie Moore. 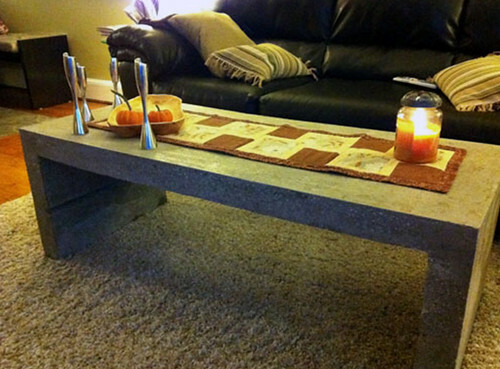 Have you used concrete in your home decorating? Tell us about it in the comments. 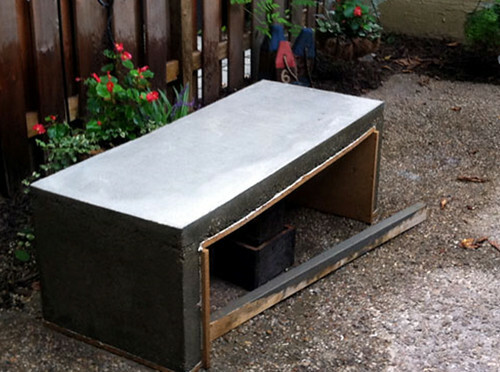 We have found the perfect mix of concrete to just skim coat over wood (or almost anything else) and have been building and selling (lighter weight concrete) tables ever since. How many bags of concrete were used? Do you happen to have the plans for this? Trying to build now but getting really overwhelmed by all of the measurements! Chris — You can contact Katie Moore at katie@oliosdesign.com to get more details. She’s the person who wrote the post and her husband made the table. Good luck! Looks like the bench from La la land!